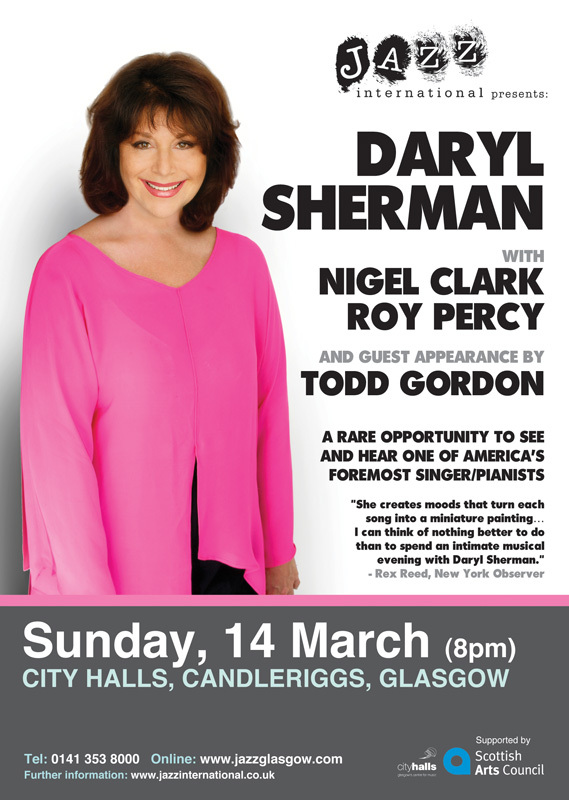 Daryl Sherman, the Manhattan-based singer and pianist who made her Glasgow debut in the City Halls Recital Room on Sunday, must have tripped back to her hotel a very happy lady. Why? Because she had the most enthusiastic response to her performance that I think I’ve seen at that venue. Sherman has a girlish, Blossom Dearie-esque voice which is not every jazz fan’s cup of Earl Grey (it didn’t do anything for the aficionada sitting next to me – at least at the outset) , but she also has impeccable taste – which is a rare attribute these days. Not only was her choice of material first-class but the atmosphere she created also distinguished her gig from most others. It was relaxed and fun, but there was no sense that the concert had been thrown together – as can often be the case when a visiting soloist throws his or her lot in with local musicians. Mind you, Sherman had selected the ideal local musicians for her easygoing style and penchant for the less well-thumbed pages of the Great American Songbook. She really couldn’t have asked for better accompaniment than she got from bassist Roy Percy and, especially, the great guitarist Nigel Clark – both of whom gamely, and stylishly, joined her on a string of songs which they had probably never had call to play before. Flying Down to Rio (from the Astaire-Rogers movie of the same name), Getting To Know You (The King and I) and Jeepers Creepers (from Goin’ Places) were all ensemble treats featuring Sherman’s vocal and pianistic talents. On How Insensitive, she stepped into Carol Kidd’s shoes by duetting memorably with Nigel Clark. The results were sublime – Sherman’s vocals (which sounded deeper when she was singing in what I assume was Portuguese) and Clark’s sensitive guitar playing were a perfect match. As were the vocal duets with guest artist Todd Gordon – playful versions of Fly Me to the Moon and Manhattan, both dished up with rarely-performed verses. By the end of the night, Sherman had made herself more than a few new fans – and I think you could safely say she’ll be back.